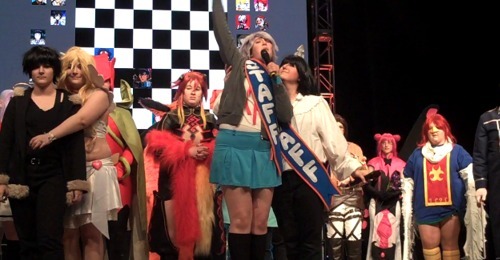 Scarlet Rhapsody > ConTV > [ConTV] Anime Boston 2015: Get Haypa! Editor’s Notes: There’s this running joke that I’m the last Filipino alive in Boston. I’ve had this song stuck in my head weeks before the con as I was looking up F-pop / OPM songs on Youtube. This is pretty much the latest dance craze in South East Asia. I don’t think it will be ever big here like how “Gangnam Style” was, but it’s still a fun song. Like all my videos, I want to try and capture everything – all cosplayers of all skill levels and fandoms. I love Anime Boston’s cosplay events; there’s plenty to check out from Cosplay Chess, masquerade, dating game, etc to record video of cosplayers doing what they do best – having fun and being themselves. Thank you everyone for being in the video!